Here are eight free inspirational quotes to comfort and strengthen you in challenging situations. 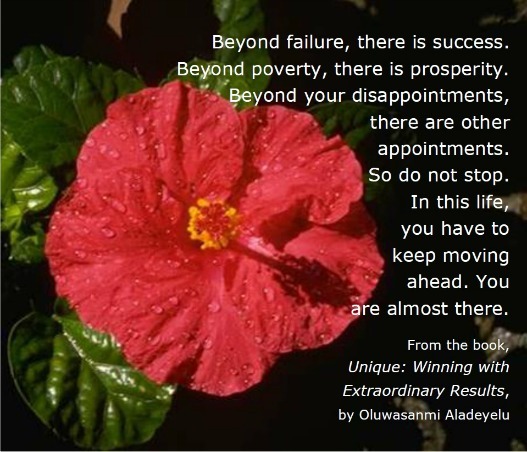 These quotes were all taken from the book, Unique: Winning with Extraordinary Results (author: Oluwasanmi Aladeyelu; editor: Ursula Lang). "You may feel you have failed but know this: past failures don’t have to matter anymore. God is not done with you yet; there is place for hope and change." "A victorious person is not one who has never failed before. Successful people have their own past failures too, but they refused to remain failures. Tough times don’t last but tough people do." "When the path you tread in life inevitably leads you through hell, you can only press on. The call to greatness absolutely demands that you keep moving on, despite all you may have to go through." "Beyond failure, there is success. Beyond poverty, there is prosperity. Beyond your disappointments, there are other appointments. So do not stop. In this life, you have to keep moving ahead. You are almost there." "Don’t just stand there in despair while Satan does whatever he likes. Bring it on! Get God on the scene. One whisper from Heaven will do more than all your screams." "Now is the time when God wants to show up strong on your behalf. Get ready. 'The powers that be' may have driven you to a dead end, but God has not forgotten you. When your back is against the wall, He will surely come and see you!" "The people who go far with God are those who are open and honest with Him. They tell it the way it really is. We can tell God what we are going through, any day and any time. No problem is ever too big for Him, no trouble too much for Him to handle. He really cares to know how it is with us — though we can’t hide anything from Him, anyway. Yet He might not help, however, if we aren’t real with Him." "If you believe God can pull you through, He will. You do not have to impress anyone in your cathedral with whatever. You do not even have to speak grammatically. It is not compulsory that you pray in the Queen’s English. 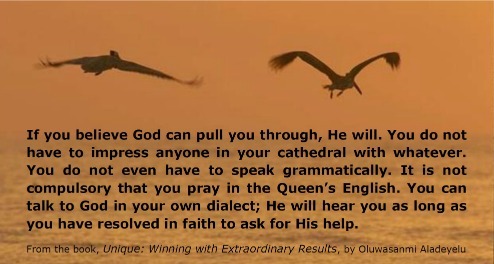 You can talk to God in your own dialect; He will hear you as long as you have resolved in faith to ask for His help."